Rulmeca Holding convened the international group’s annual two day sales budget meeting in Wilmington, NC this year. Hurricane-related damage to some Wilmington businesses necessitated last minute program changes. However, the meetings were successful and the guests were able to enjoy walking and river tours of historic Wilmington, local cuisine, and quality time on beautiful Wrightsville Beach. The Rulmeca Group normally meets at a major hotel each October to review the year’s progress and discuss forecasts for the upcoming year. Hurricane Florence interrupted this year’s plans and necessitated a major change in accommodations. We split our group into three beach houses and a motel on Wrightsville Beach. No one complained. Our one hour tour on the Cape Fear River provided a ship-side view of the Port of Wilmington. This was important because Rulmeca Corporation uses the port for all inbound sea freight from Rulmeca Germany. Our guided walking tour through downtown Wilmington enabled everyone to learn something about the city’s nearly 300 years of history. As a major US port, Wilmington has played an important part in the North Carolina economy, starting in colonial times. We enjoyed catered buffet breakfasts and lunches at the beach house, but we splurged in downtown Wilmington with some fine dining. In addition the group shown here, our colleagues came from Italy, Germany, Sweden, England, Canada, Denmark, France, Portugal, Finland, South Africa, Poland, China, Spain, Thailand, Malaysia, Turkey, Indonesia, Singapore, and Australia. Our visit to historic Wilmington included a tour and dinner in this antebellum Greek Revival mansion, built in 1842. Damaged during the hurricane, this house was beautifully repaired…just in time for our group. 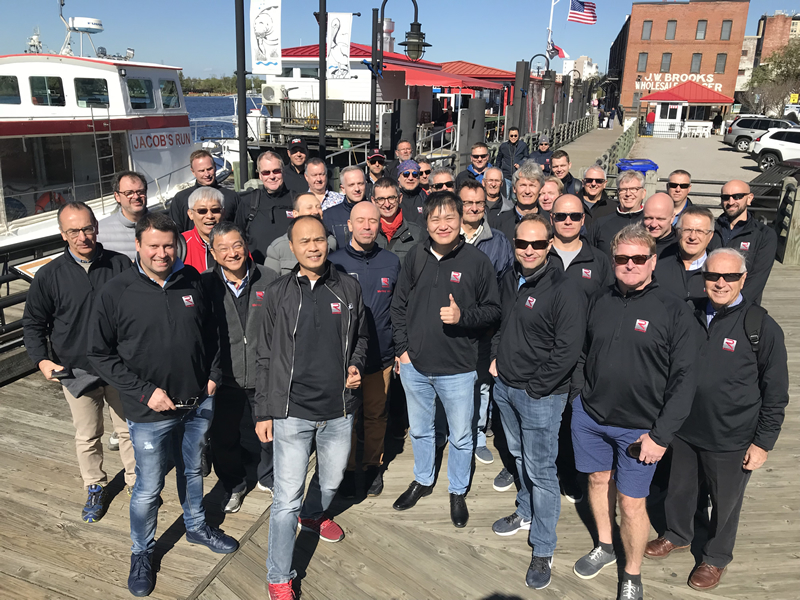 After enduring a high winds and heavy rains in September, it was nice to enjoy some good weather with our international colleagues in October. We saw more than one beautiful sunrise on Wrightsville Beach.